Environics has released a new poll (results via ThreeHundredEight.com) showing a big change from its previous one: the Liberals have dropped from 37% to 30%, going from a lead of 4 to a deficit of 1. Of course, the 37% was a big outlier, and the new results align much more closely with the other polls. However, given the EKOS poll from yesterday, there seems to be a slight trend of the Grits settling down a bit, and the Tories regaining a clear, but small lead. Conservatives now lead by 2.4% nationally in my poll average. EKOS has published its poll of the week, which shows the Conservatives widening their advantage over the Liberals. Compared to last week's EKOS poll, both main parties gained at the expense of the smaller ones, so this is not bad news per se for the Liberals. In fact, most of the increase in lead for the Tories came from Alberta and BC results being more "normal" this week. The Conservative lead in the poll average is now just over 2%. My recent poll average now gives the Conservatives a 1-2/3 point lead nationally. ... and Grits up by 11 over Tories. This is in line with recent polls, and so much so that incorporating this poll at a weight of about 20% does not at all change polling averages for the three main parties, rounded to the nearest tenth! Needless today, no seat projection change either. The Tory lead in national voting intentions averaged over the last few polls is now 1.5%. The latest Angus Reid poll shows a Conservative lead roughly stable from 3 weeks ago. The stable trend is consistent with what other pollsters have had lately, although Angus pegs the support levels somewhat more favourably to the Tories. 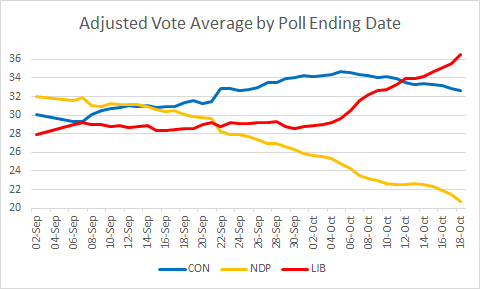 The latter shouldn't be surprising: last summer, when the Tories also had a slight lead over the Liberals, Angus tended to be slightly more favourable to the Conservatives; we're witnessing a return to that pattern. The national poll average still has a Tory lead of just over 1 point. Why didn't it go up by more with this poll? The reason is that this poll is almost one full week more recent than the previous latest poll, meaning that it completed the depreciation of a few polls from the first half of January, when the Tories were higher. Environics: Liberals Up... by 4! A new Environics poll gives the Liberals a clear lead. Relative to the Tories, this poll is in line with previous polls for the Liberals in BC, good in Ontario and Atlantic Canada, and somewhat suspicious in Québec and the Prairies. The NDP does poorly across the board (that's perhaps why the Grits are so high), while the Bloc does OK, but because of Liberal strength in Québec, they only retain a narrow lead. The national poll average now shows a Tory lead of just over 1 point. The latest EKOS poll shows the Grits back under 30%, and trailing by 2. Compared to last week, the Liberals lost 3 points, while the Tories remained flat at 31% - nothing to rejoice about for either party. In fact, the regional breakdown is further cause for gloom for both: outside of MB/SK/AB, the Grits lost about 4 points everywhere, while the Tories lost 1-2 points in Ontario and Québec, and stayed at a dismal 30.3% in BC. Is all this great news for the other parties? Yes for the Bloc, up a whopping 6.8% from last week. For the NDP, the top line figure isn't that good (flat - no noticeable bump from Jack Layton's cancer announcement), but the regional breakdown is: decent gains in Ontario and BC, exactly their two crucial provinces. This poll is reassuring in a sense: EKOS had been a bit of an outlier lately, being the only pollster showing the Grits in front, even though historically, they've been a middle-of-the-road one. In the latest poll, however, the 2-point Tory lead puts EKOS back almost perfectly in line with the recent poll average. Nanos Research has released its first poll of the year, and it shows a 1.7% Tory lead, which is consistent with the recent poll average. Where Nanos diverges from recent polls, however, is that it has the Greens much lower than other ones (5.6%), and the Liberals (33.9%) and Conservatives (35.6%) much higher. Moreover, in the key battleground of Ontario, the NDP posted a paltry 10.9% in this poll. This is tied for the lowest result for the Bloc since the creation of this website. The Bloc is not actually doing that poorly in recent polls - it's just that the Grits' rise is hurting them. Indeed, for the Liberals, this is tied for their highest projection since mid-August; for the NDP, this is tied for the lowest since late October, again on Liberal strength rather than their own weakness. 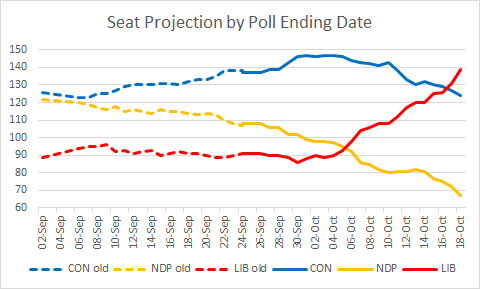 All seats are now within one seat of the September 4 projections - exactly 5 months ago, and just before the Liberals' election bravado started destroying their numbers in the polls. Michael Ignatieff is not out of the woods yet, but can now clearly see the light at the end of the tunnel. At the same time, Stephen Harper must be worried: this projection is the worst for the Tories since the launch of this website in late July, and indeed EKOS hasn't had the Liberals ahead two weeks in a row since late June/early July. He must hope that the Olympic frenzy erases some of the negative feelings toward him that have blossomed lately. In terms of vote intentions, my poll average now shows a 1.5% advantage for the Tories. 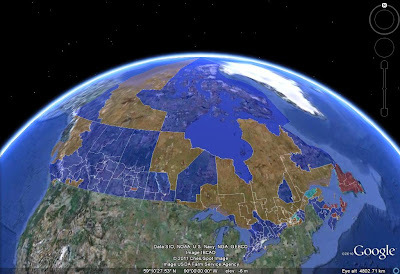 It probably needs to invert (or almost) to produce a tie in the seat projection. Here is the latest Harris-Decima poll. It shows a tie between Grits and Tories over the past 2 weeks. However, we know from some media reports from last week that over Jan. 21-24, Harris-Decima had the Tories 1 point ahead. Thus, they probably had the Liberals ahead over Jan. 28-31. Additionally, the breakdown shows that over the 2 weeks, the Liberals led by 5 points among women, and lagged by 3 among men. So if Harris-Decima showed decimals in their national numbers, the Liberals would probably be slightly ahead over 2 weeks - and hence ahead by about 2 points in the latest week. The Conservative numbers in this poll were actually par for the course, except in Québec where they scored a dismal 13%. It is that Liberals doing well in the 3 largest provinces that closed the gap: 28% in Québec, 40% in Ontario and 30% in BC. The NDP numbers were on the weak side, but nothing disastrous there; the Bloc did OK as well, with a 10-point lead.